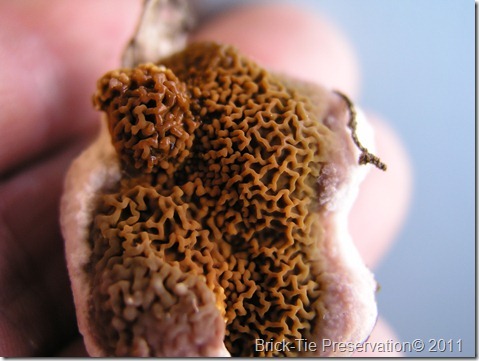 You are here: Home / Dry Rot / Can you identify Dry Rot, without a fruiting body to look at? here’s one way…..snap crackle and pop. Dry Rot has perhaps the most striking of fruiting body’s – brackets or plates of lovely convoluted and rust coloured sporophores’ which are unmistakable. However, only a mature infection will produce such handy nameplates and sometimes they’ve been removed or are hidden from view. The video is one I shot the other day in a semi-derelict house in Leeds. Dry Rot has had a field day in the past, due to a pipe burst (no drying done). The infection has slowed to a snails pace, as the timbers have dried somewhat and the only fruiting body’s are under the floors; out of sight. As it happens they’ve shrivelled up too so the bright rusty colours seen above are not there. There is plenty of fungal growth though and some is quite dry. There are decayed timbers too. 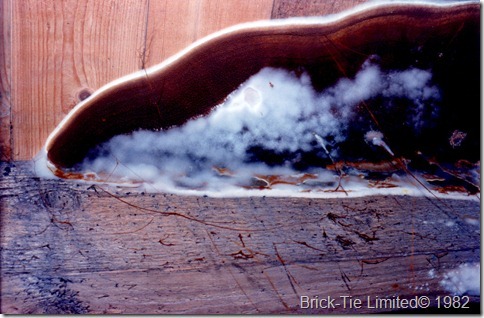 This is the thing I wanted to point out to you; unlike wet rot mycelium, Dry Rot strands are brittle when dried. I did have a handful of strands from a Fibroporia outbreak in a jar in the office and though these were years old, they were as flexible as cotton twine. Fibroporia can produce spectacular fugal growth and is miss-diagnosed as dry rot more than anything else. As you will see and hear in the video, the Dry Rot strands snap easily because this part of the infection has dried out. This is a handy tip for surveyors, because even if this was the only bit of fungus you found – it narrows the species right back to Serpula lacrymans; The Dry Rot we know and love. The effects of the decay on the joinery in particular is also a great pointer. See how the skirting curves and bends? All the cellulose contained in the wood is extracted by the Dry Rot, leaving the lignin behind. The removal of these sugars destroys the longitudinal strength of the wood; hence the cuboidal cracking. The brown lignin is left; confirming the decay organism as a ‘brown rot’. Whilst there are plenty of Wet Rots in the brown rot category, only Dry Rot has strands which are brittle when dried and bends and curves the joinery in such spectacular fashion. Cubic cracking will happen with wet rots too, but it is much less well pronounced and tends to be finer and the cubes smaller. I hope you find this useful…now go find some. Thank you for your comment, I’m glad you found the video useful. 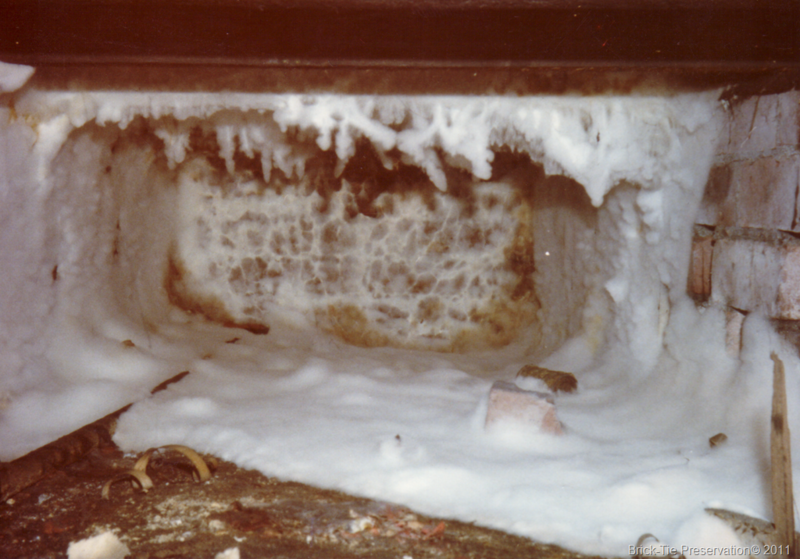 Any persistant leak could feed a dry rot outbreak and should be found and stopped. 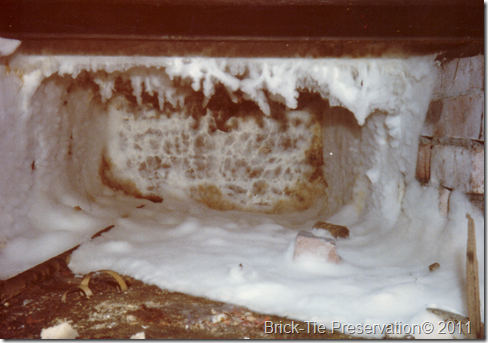 A fruiting body isn’t the real heart of a Dry Rot outbreak; merely the end product. It doesn’t need feeding as such, it is manufactured from nutriants absorbed from wood and is often produced when an outbreak is maturing or is suffering stress, such as when things start to dry out. The real damage is done by the fungal hypha, which are in the wood and can grow behind plaster and in the cavities of masonry. The crucial thing is moisture – dry the wall and timber and the rot will die. If you were in Yorkshire I’d be on my way over to take a look, however as your in Hampshire try the Property Care Association web site. There’s a handy ‘find a member’ widget which works really well, whether you need a contractor or an independent consultant. There’s a link to the PCA on the right. Thanks again for looking in. Let me know if I can help in the future. I can see why you’d be worried. However in practice it’s not as hard as you think. Fibroporia is usually very white and if you have the time just gently peel off some and dry it in the airing cupboard overnight. 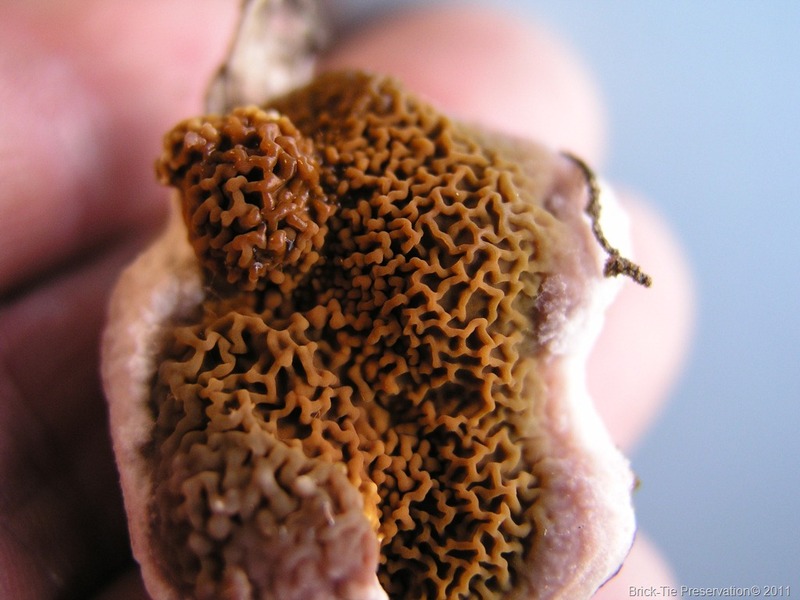 If you can still ball it in the palm of your hand without it crumbling and snapping then it’s a wet rot mycelium. Whilst some wet rots produce ‘strands’ Fibroporia is the most prolific, so if there are is loads of stringy white mycelium, which doesn’t dry to a brittle material, it’s probibly Fibroporia. Howeverr, don’t get too worried; as long as it’s not Dry Rot (which you can easily diagnose), it doesn’t in practice really matter which wet rot it is – you treat them all the same way. If in doubt as to which wet rot it is, I’d recommend that you just identify it as a wet rot species; that way you’re being honest and accurate and won’t look a fool if someone identifies it scientifically as another similar, but different species. Hi we have detected dry rot in our hallway I got a surveyor in and he told us take our subfloor out and chip back some of our plaster back to the bare brick. The cost of treating the hall is estimated at €700 to eradicate the dry rot professionally. It may have travelled into our sitting room too. My husband wants to treat it himself and put in a concrete floor but I’m very concerned about this as I think it should be done by the professionals and we are not 100%sure how the moisture came in, in the first place, any advice would be greatly appreciated, thank you. You should always get professional advice when dealing with dry rot. Find a local PCA member via the PCA web site. Identifying and mending the moisture source is crucial to success. Thank you, we have gone down the professional route.